…Shall keep us from our appointed time at the grill. 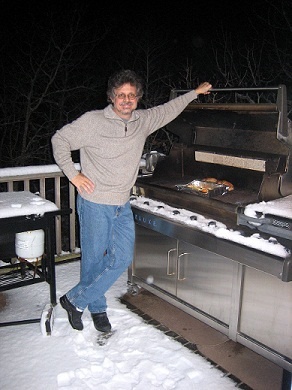 And, yes, although I live in Miami, I do have experience with grilling in the snow. 1) Don’t position your grill in a garage or other outbuilding, even with the door open. Doing so creates a fire hazard and a potentially dangerous build-up of carbon monoxide. Do try to protect your grill from wind and low-hanging, snow covered tree branches. 2) Add 25 percent to the cooking time to compensate for cold outdoor temperatures. If using a charcoal grill, have extra coals in a separate grill or chimney so you can maintain your desired cooking temperature. 3) Remember, even though it’s cold outside, your grill is HOT! Wear heavy duty grilling gloves when working around the grill to avoid burning yourself.